Mohandas Karamchand Gandhi, who is more popularly known as Mahatma Gandhi was born on October 2nd, 1869 in Porbandar, India. Born to Karamchand Gandhi and Putlibai, Gandhi became one of the most well known Indian Nationalist Leaders, who advocated India’s independence movement during the British Rule. 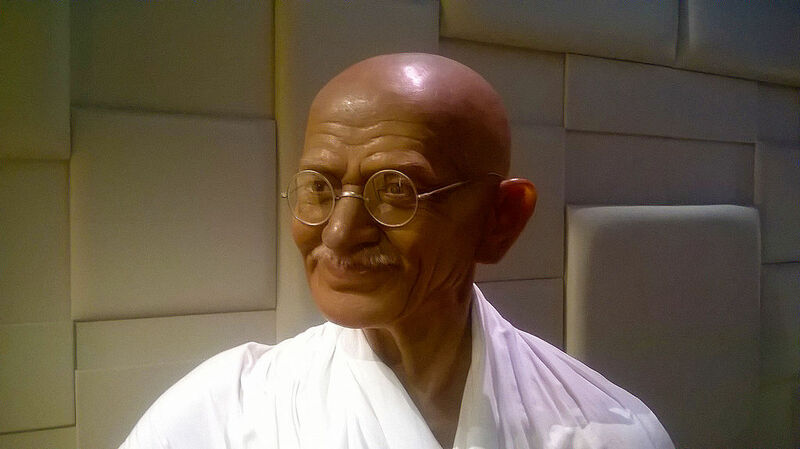 The following are 10 facts about Gandhi. 1. Apart from his birth name which was Mohandas Karamchand Gandhi, Gandhi was also given the title of ‘Father of The Nation’ by Netaji Subhas Chandra Bose. This title was affectionately accepted by the Indian community, who then referred to Gandhi as “Bapu” (Hindi translation of Father of the Nation). One of the primary reasons for Gandhi to be bestowed with this title was due to his vision for his country. His teachings paved a path and gave India a direction to lead itself with spiritual and political superiority. 2. Gandhi’s non-violent nature is credited to his rigorous worship of the Jain religion which preached non-violence, meditation, vegetarianism and fasting. Gandhi was also an ardent follower and believer of the Hindu god, Vishnu. 3. In May of 1883, at the age of 13, Gandhi had an arranged marriage to a merchant’s daughter named Kasturba Makanji and had four sons. Contrary to his later years as an adult, Gandhi grew up to become a rather rebellious teenager. He rebelled against his parents, his religious beliefs and was often found eating meat, stealing from household servants and smoking. 4. As a young adult, Gandhi aspired to become a doctor, however, his father had other hopes from him. Karamchand Gandhi wanted to steer his son towards the legal profession. So, at the mere age of 18 and after the birth of his four sons, Gandhi sailed to London in the year 1888 to study law and honor his father’s wishes. 5. Due to the culture shock which Gandhi faced during the three years he spent in London, he gradually reverted back to his religious ways and sought to have a meatless diet, as well as divulge himself into reading several sacred texts in order to learn more about world religions. 6. In due time, Gandhi struggled to gain footing and acceptance as a lawyer in India and so he sailed to South Africa on a one-year contract to perform legal services where he faced immense discrimination by the British and Boer authorities. This was the time when Gandhi was inspired to eradicate the deep-rooted problem of color prejudice. His desire to fight hardships and diseases turned him into a force for civil rights. 7. In 1894 Gandhi created the Natal Indian Congress to fight discrimination. With the encouragement of fellow Indian immigrants, Gandhi stayed back in South Africa with his wife and children and ran a successful legal practice. He continued to study world religions and soon adopted a life of celibacy and simplicity which was free of all material goods. 8. The year 1906 saw the first of many civil-disobedience campaigns which were known as “Satyagraha” (Truth and Firmness), led by Gandhi himself. His campaigns fought for Indian Liberation and their rights for equal and fair treatment. The Satyagraha were a series of peaceful protests and strike, where the use of violence was never encouraged. He often encouraged government officials and students to lead mass boycotts in order to have their voices heard by the British. 9. Gandhi encouraged the citizens to stop purchasing British goods as well as paying taxes. This led to him spinning a wheel and producing his own cloth. This spinning wheel soon became the symbol of independence for India. 10. The Salt March, which is also famously known as the Dandi March was a significant period of Gandhi’s life. He along with thousands of Indians were imprisoned several times due to their acts of revolting against the British rule. In the year 1942, Gandhi also launched the “Quit India” movement which called for the immediate withdrawal of the British from Indian governance. Ironically, on January 30th, 1948, 78-year-old Gandhi who was a strong believer of non-violence was shot at point blank range by a Hindu extremist as he was upset with Gandhi’s tolerance of Muslims. A man who donned a simple living lifestyle became a revolutionary leader and inspired the entire world of future human rights movements, which included Nelson Mandela as well as Martin Luther King Jr. This is how Mohandas Karamchand Gandhi, became Mahatma Gandhi (The great souled one).